“…Luther does not wish to ignore the Old Testament in preaching. In fact, he vehemently opposes those who would reject the Old Testament. He scolds them: ‘What a fine lot of tender and pious children we are! In order that we might not have to study in the Scriptures and learn Christ there, we simply regard the entire Old Testament as of no account, as done for and no longer valid’” (Greidanus, 117-118). Is the Old Testament a valuable resource for the pulpit? Does the one who takes the pulpit to preach only use the Old Testament as a database of quotes and stories? Can a sermon be crafted from the Old Testament to represent Christ using a responsible hermeneutic? For those of us who have heard sermons from the Old Testament (if there are any of us), we have probably heard wonderful sermons from the Old Testament and sermons that lead us down a path of speculation and bad proof-texts. For many of us, the pulpit is bereft of a sermon from the Old Testament, leaving us in ignorance with regard to a majority of God's Word. Pastors everywhere need to bridge this gap for their flocks. 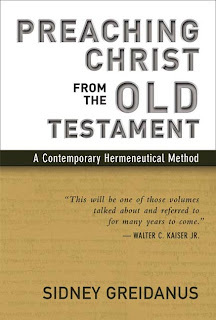 Sidney Greidanus has provided a valuable resource for the pastor, teacher, and student: Preaching Christ from the Old Testament: A Contemporary Hermeneutical Method. In this text, Greidanus gives us a solid, biblical rationale for the preaching of the Old Testament. Moreover, he gives an incredible lesson on the approaches different theologians have used throughout the history of the Church. He highlights the struggles and triumphs. Not afraid to be critical of certain techniques, Greidanus is quick to cite those with whom he disagrees, showing their strengths (if any) and weaknesses. After the history lesson, Greidanus takes the reader through his method for interpreting the Old Testament texts. I think that this text would be of great value for anyone who will invest the mental energy! It is difficult at times, but the author provides example after example, holding the reader's hand (and attention) throughout the whole text. The doctrine of the Trinity is a difficult doctrine. In fact, it is so difficult that many of us have left it. If asked to explain the Trinity, a large portion of evangelicals would fall into heresy. A distinctive of Christianity, the doctrine of the Trinity is a firm foundation for us. True, it is impossible to grasp the infinite nature of the Triune, but we should stretch ourselves. I encourage you to do so and read An Unpublished Essay on the Trinity by Jonathan Edwards. but in these last days he has spoken to us by his Son. We hear much today about being in the last days. We hear preachers speak on the Middle East, neutron bombs, and countdowns to a late, great planet. They have large charts with illustrations that are to give us a time table for the end of time and how to understand the hidden meaning of certain biblical texts. It is PowerPoint Prophecy, and it is on every Sunday morning, urging us to hasten the return of the Lord by doing this or that. If they are not talking about the end-times prophecies, then they are urging you to do this and that to hear from God. Words-of-knowledge and individual prophecies are hot commodities in certain congregations. We want to hear something from God, and we will jump through all sorts of hoops to do so. What does Scripture say about this emphasis? For the early converts to Christianity from Judaism, the writings that we refer to as the Old Testament were the writings detailing their “adoption, the glory, the covenants, the giving of the law, the worship, and the promises” (Romans 9:4). Therefore, they held these words in high regard, as they rightly should have! The prophets were remarkable messengers of God, detailing visions of God and his interactions with humanity. After all, there had been around 400 years of silence between the last prophet of the Old Testament and the coming of John the Baptist. That is a long time to wait. The message of the Old Testament was deeply important to them. These words were handed down to them by their ancestors who had actually heard the prophets. Moreover, the recipients of this letter were probably second generation Christians, having never seen Christ in person. They are basing their faith on the testimony of other people. We are much like them. We have not seen Christ either. They are even suffering because of Christ. “We should go back to the message of the prophets,” they probably thought, “God spoke to our fathers by the prophets, so let’s forget this Christ. If only God would speak to us in the midst of this, confirming our faith, then we might believe in Jesus.” Does that sound like us? Do we think of the days before our conversion with fondness? How do we deal with this reminiscing? How did they? When has God spoken? Many of us would say, long ago. We feel distant from the time of the Bible. But is that true? Is that the way the inspired Word of God says we should think about the nature of special revelation? The writer to the Hebrews says that God spoke long ago, but in these last days, he has spoken again. What a relief for the reader! The silence has been broken. The wait is over. The words of Isaiah ring in our ears, “Remember not the things former things, nor consider the things of old. Behold, I am doing a new thing, now it springs forth, do you not perceive it? I will make a way in the wilderness and rivers in the desert” (Isaiah 43:18,19). These are the last days! The recipients of this letter were in the last days. We have been in the last days since then. Make note of that! The comfort that the writer provides is based in correct theology. That is how the writer starts a letter to a suffering church. There are no computer games or cookies in this care package, just good theology. The writer begins to make another distinction between the way God spoke in the past to our fathers and the way he does so in the present to us. At this point, the recipient may have been skeptical, noting that he has not heard of any prophets in their city. How does the writer address this skepticism? Again, he does so with good theology. “[B]ut in these last days, he has spoken to us by his Son” (v.2a). Even today, God has spoken to us by his Son. We have a full understanding that the entire written Word of God testifies to the Incarnate Word of God. “For God, who said, ‘Let light shine out of darkness,’ has shone in our hearts to give the light of the knowledge of the glory of God in the face of Jesus Christ” (2 Corinthians 4:6). Christ is the foundation of our hope as Christians. He is the anchor that we need so that we do not drift away from God. In the light of the last post, I thought that it would be a great thing to meditate on the supremacy of Christ. I found the following video that will hopefully be a springboard into the text of Hebrews. and through whom also he created the world. In our culture of pragmatism and secular humanism, the shape of evangelicalism has morphed into a self-help, pop-psychology rather than standing strong for a passionate striving for holiness and reverencing of God. This has led to best-selling “Christian” books focused on the self, propagating the notion that faith is a means by which you can “name-and-claim” health, wealth, and prosperity or even speak things into existence. Is this new to the Church? Do we face a new dilemma? Will this super-market theology with its theme-park ecclesiology provide substance for a suffering a world? We can have thousands of purpose-driven, plastic smiles in our stadiums, but how would the Christians who were martyred in a stadium feel about our congregations? Would they find brothers and sisters with whom they would lock arms as they were shredded by the fierce jaws of lions? “Blessed are you when others revile you and persecute you and utter all kinds of evil against you falsely on my account” (Matthew 5:11). “[Y]ou will be hated by all for my name’s sake” (Matthew 10:22b). “So therefore, any one of you who does not renounce all that he has cannot be my disciple” (Luke 14:33). “Then they left the presence of the council, rejoicing that they were counted worthy to suffer dishonor for the name” (Acts 5:41). “…if children, then heirs—heirs of God and fellow heirs with Christ, provided we suffer with him” (Romans 8:17). Do we preach this to our people? Do we ignore these texts? The Christian will be persecuted for his faith. It is not optional. The above texts make that clear. What do we do then? Well, Christ got us into this; maybe we would be better off if we left him and this world of Christianity. What do we think of this? Our congregations have seen those who have “tried Christ,” but when it became difficult they deserted him. This is what we call apostasy. How do we fight apostasy in our congregations and in our own lives? In forgetting the context of the suffering Church in Scripture, we rob Christ of his glory (2 Corinthians 12:9,10). Many in our congregations are weary of the race and are ready to throw in the towel. Can we find an anchor that will hold us close to Christ, equipping us for suffering? The Epistle to the Hebrews is such an anchor. The authorship of the letter is not exactly known, and we do not know much about the recipients. However, what we do find in the text is in a congregation many people were forsaking the name of Christ because of suffering for bearing his name (cf. Hebrews 10:25,34). Their dilemma is not too distant from ours. How does the writer begin to address their problem? Knowing this will provide a foundation by which we will battle our unbelief. The author, under the inspiration of the Holy Spirit, begins, “Long ago, at many times and in many ways, God spoke to our fathers by the prophets, but in these last days he has spoken to us by his Son, whom he appointed the heir of all things, through whom also he created the world” (Hebrews 1:1,2). There we have our foundation: Christ Jesus, the Incarnate Word (cf. John 1:1-3). If we know Jesus rightly and passionately, the one through whom the world was created, we may begin our battle with the proper footing (cf. Ephesians 6:15). Because of our gross misunderstanding of Christ, we have no rock upon which to stand in times of persecution. A proper view of Christ will transform our congregations into people who will follow passionately after him, going into the hard places. We will become a people who are being conformed to the image of Christ, “who for the joy that was set before him endured the cross, despising the shame, and is seated at the right hand of the throne of God” (Hebrews 12:2, cf. Romans 8:29).